On August 11, as part of the Asia-Pacific Local Champions Exhibition in Cambodia, delegations of farmers and supporters from nine different countries visited the model farm in Takeo Province. 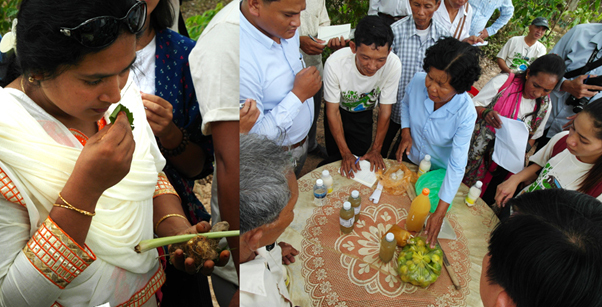 Visitors from Bangladesh, Colombia, Laos, Nepal, Philippines, Thailand, Tonga and Vietnam came to witness the process of change with the official opening of the first training center for farmers in Takeo: the Mongkol (Healthy Spirit) Community Learning Center. From Phnom Penh City to Takeo Province in the South of Cambodia there is a three and a half hour ride through the hot and dry countryside. It is August, the middle of the rainy season, but rains are scarce as the country continues its second year of drought. Almost half of the rice paddies seen along the way look abandoned or withering. In Cambodia, where 80% of all cultivated land is used for rice farming, economic vulnerability to climate change is evident. 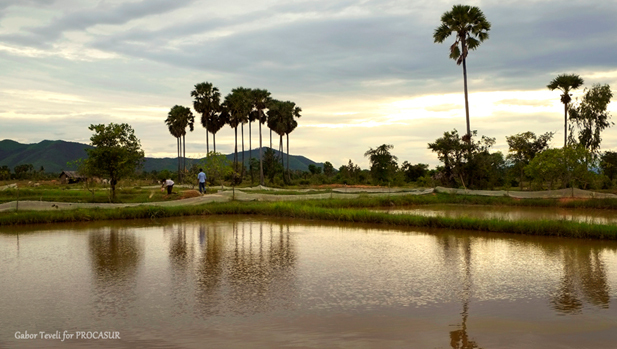 Some farms in Takeo, however, enjoy an abundance of water. With integrated farming, a growing number of smallholder farms are becoming more resilient, economic and efficient – especially when compared to monocropping, a popular farming method in rural Cambodia. Here, hand dug reservoirs are used as multipurpose fishponds, basins for organic fertilizer and irrigation holes for off-season rice. As a model, this farm in O’saray Commune was the destination of the Field Training Day at the Local Champions Exhibition, organized and supported by the Ministry of Agriculture, Forestry and Fisheries of Cambodia, IFAD and PROCASUR. Empowered by a series of trainings and Learning Routes, seven Local Champions created a model for community learning. They poured their own time, energy and resources into building a training site, a curriculum and a team for the dissemination of their knowledge. 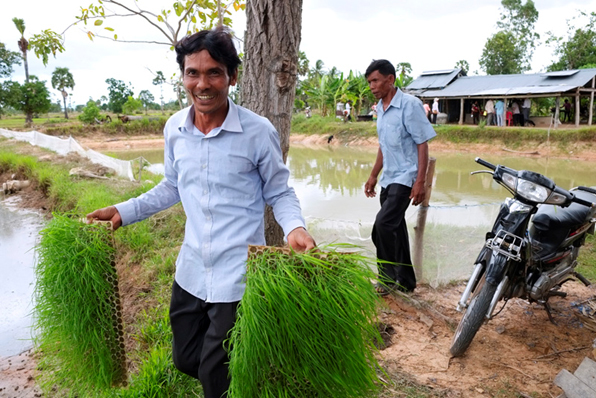 As a result, the Mongkol Community Learning Center became one of the most successful farmer-to-farmer training sites in Cambodia, open for people and innovations. 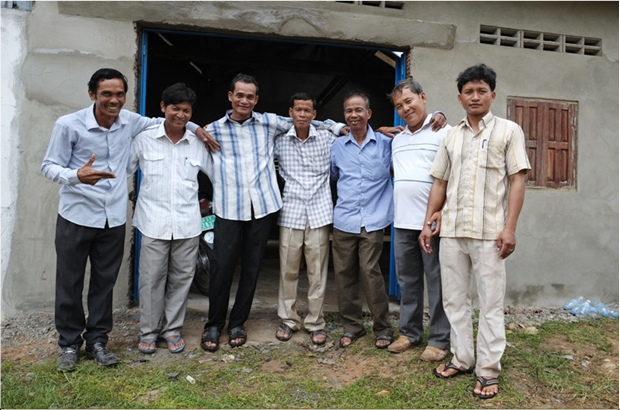 The Magnificent Seven of Takeo, the founders, builders and trainers of the Mongkol (Healthy Spirit) Community Learning Center. From left to right: Daek Dol (Director), Nget Samouen (Deputy Director), Chhin Chhorn (Financial Officer), Toen Toeung, Prom Soeun, Bounna Sun and Paet Savouen (Secretary). Nget Samouen, owner of the model farm used as learning site, also participated in the Learning Routes. 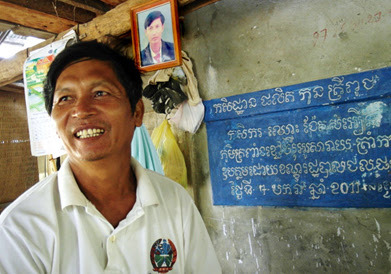 He is now the Deputy Director and one of the trainers of the Mongkol Community Learning Center. Built on his own land, with his own resources, the Mongkol CLC is the center of knowledge exchange for innovations, and an important channel of communication for the likes of Mr. Samouen to tell their stories. “I want to tell my story to others so they can learn like I have learned. I used to have one fishpond back in 2009. But all my fish died. Then I went to Thailand and learned some very useful methods. Then I came back and restarted my fish farm three years ago. Now I have 17 ponds with lots of fish to eat and sell. Many people come to us for the good fish we have” – Nget Samouen, Deputy Director of the Mongkol CLC. At the opening of the Mongkol CLC, more than a hundred people gathered from the Local Champions Exhibition to hear the welcoming notes of the farmers, their teachers and the organizers. Many praised the successful results of the knowledge exchange programs between farmers, and their self-growing network that made changes possible in poor, rural households. For the Field Training Day, six learning stations were set up by the Local Champions of Takeo to demonstrate innovations they have learned and successfully used in the production and use of EM, organic pesticides, natural hormones, and the parachuting planting method among others. “I am very happy to see all these people from Nepal, Bangladesh, even Tonga, who were interested in what we are doing, and came and asked questions from us. I am proud to be the one giving the answers.” – Daek Dol, Director of the Mongkol CLC. 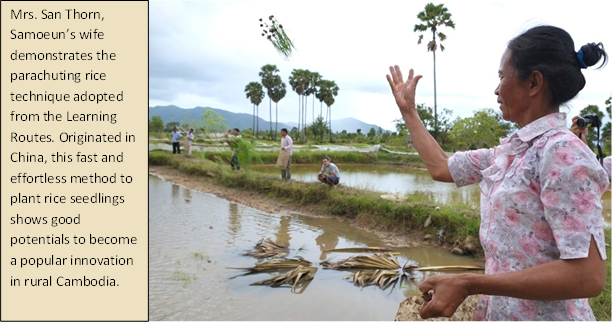 Daek Dol, Director of Mongkol CLC with rice seedling trays for parachuting.